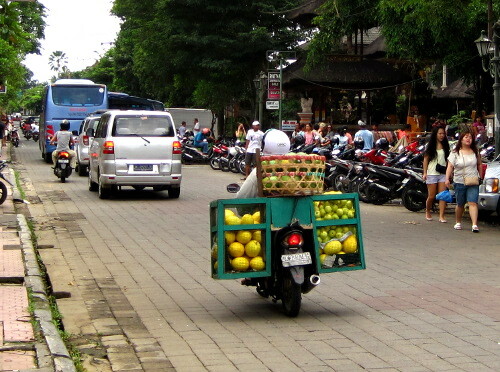 As soon as you set foot on Bali (and certainly on most Asian countries), one of the first things to hit you is traffic. Not necessarily the jam type, but the way people get around and how the traffic flow works. What we’ve learned is that there are not many traffic rules. Everyone gets to where they need to go in an organic manner, with eye contact, light honking, keeping left on the road (most of the time) and not making abrupt moves. The locals seem to say that the biggest hazards are dogs! Dogs just hang out, sometimes laying down on the road and you have to honk to make them move. Another interesting thing, which I’ll be curious to compare in other Asian countries we’ll go to, is that a large majority of vehicles here are new-looking. I was expecting it to be the other way around, with the majority having squeaky breaks or being piles of rust on wheels. Nope. Scooters don’t just transport people, they transport your shop. 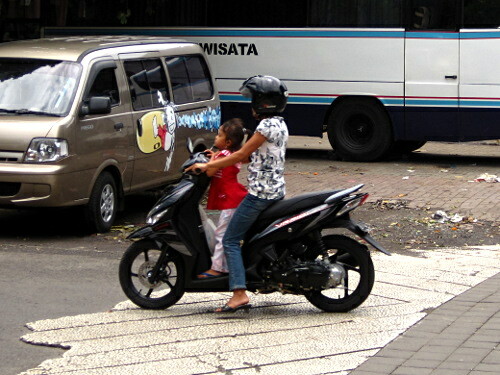 Helmets are optional and little kids are common. The seats are big enough for three people, so why not take advantage of that regardless of the passengers’ age? That little guy probably learned how to walk last week. In Ubud, there were quite a few westerners, possibly expats, kickin’ it Balinese. And my favorite… The family of four. Classic. 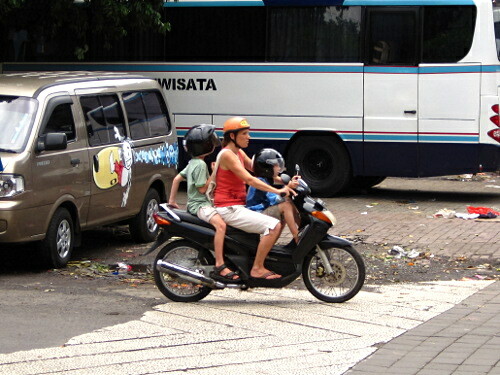 The driver has a helmet but not the passengers, the little kids are sandwiched between the two adults and the woman is riding amazon-style in the back, holding the kids. These people must have abs and arms of steel. Seeing everyone move around with ease under these circumstances definitely puts to shame our westerner paranoia of getting hurt… and is insanely entertaining. Good post, so do you see mostly scooters or motorcycles? I assume scooters. Have you tried to rent one? Ask someone if a scooter is cheaper to operate (license, register, etc.) than a car. India has tried to introduce a new cheap car, Nano, to replace the scooter, but I don’t think it have been well received. However, they show pictures of whole families on a scooter to justify getting the car. 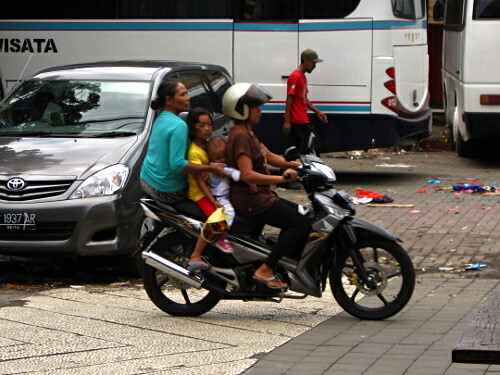 For future reference: most popular scooter in Bali appears to be the Honda Vario. 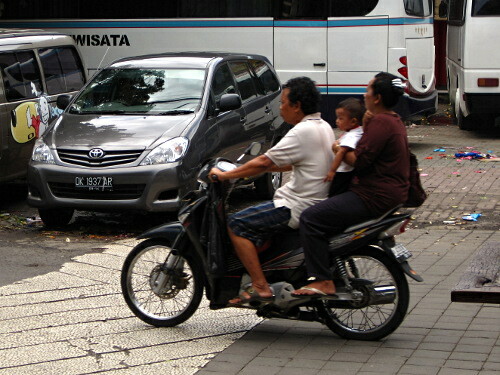 Based on body shape alone, the closest scooter to that available in the US is the Honda SH150i. Would love to see an American family of 4 on one!